Do you remember the videos shown during the iPad2 launch? While I was mesmerized by the fun factor of the device, I was really touched by the way the iPad is being used to help kids with autism. It’s amazing to me that the tablet is helping these kids develop skills and gain independence. When I connected with Gary James, founder and creator of the Apps for Children with Special Needs site, I was truly impressed with his effort to build a resource for parents and caregivers of special needs kids. He agreed to an interview, which I’m delighted to share with you today. 1. Although it’s getting a lot of exposure now, the idea that mobile apps could help kids with autism and other special needs probably wasn’t as evident a year ago when the iPad was introduced. How did you discover that apps for kids could benefit these children? A. Well, I have always been interested in electronics, computers, video games, big TVs–just like every other guy out there, but the real wake up was when my son was diagnosed with special needs. Ever since that day, I have always looked for ways to help him and also teach myself how to help others. So I have had a Mac for 10 years now and when the iPad came out, I was ready to go, knowing that this could be an amazing new way for our children to interact with a product that can help them develop mentally. Touch was the key. 2. The Apps for Children with Special Needs site (a4cwsn.com) seems like a godsend for all parents, not just those adults who support special needs kids. The app index of videos alone is extremely valuable. Did you have certain ideas in mind when you created the site, or did it evolve over time? A. I created the site to help families like mine find apps that were useful for certain things, and at the same time show them how the apps worked so they would not waste their money if it was not what they needed. The site is evolving very, very fast. I am in the process of putting together categories unique to special needs children that will make it possible to search by therapy categories also. So if someone needs help with speech or AAC, for example, they will be able to see all the apps in those categories from 99¢ up to $350 on video before spending any money. 3. I love the JaMeos: video previews of storybook apps that can be digested in Just a Minute. With no commentary or voice over review, it’s just a brief walk-through of the beginning of a storybook app. What gave you the idea for this approach? A. I came up with this idea after reading a story on my iPad by a company in England called Story Mouse. Their apps took me back to my childhood, when I had three TV channels and it was all about imagination and great storytelling. I think if people want to buy a book, it should start out with a good story, much like when you want to see a movie, you watch the trailers first and then decide what to do. My brother actually came up with the name as our last name is James and the clips are like cameos, thus Jameos and the abbreviation JAM worked well for Just a Minute. 4. I’d imagine that the community of parents and caregivers of special needs kids would be pretty choosy about the resources they use. What sort of feedback have you received on the site and on the tools you’ve provided? A. I get amazing amounts of feedback from all over the world, the video podcast I provide to iTunes under Special Needs is ranked in the top 5 podcasts in over 40 countries. So I get ideas of what is missing, what people like and don’t like, apps I should look at and not look at, you name it and I hear it. I must say that most of the feedback about the site is very positive, parents telling me how much time and money I have saved them. This is why I started it in the first place. 5. I notice you’re also active on Facebook and Twitter. Have you found that social media makes it easier for people in the special needs community to connect with needed resources, and each other? A. Twitter is a great way to get a message out to millions of people, but what I have found is that they really have to be interested in what you are saying and doing. The main issue with Twitter seems to be that people just want to have large numbers following them and don’t really care what or when they say things. Facebook, on the other hand, is much more personal. Pictures and information about interests similar to yours seem to bring together communities of great people. We recently held a Facebook party to celebrate some great developers and gave away over 300 amazing apps to people who otherwise may not have had the opportunity, including an app worth $500 and another one worth $200. What happened with the numbers was amazing, the amount of times my posts were read came to something like 600,000 in a 24 hour period. Now that is good marketing! 6. As a writer/illustrator myself, I have a big need to enrich the lives of others. Knowing that there is a possibility that special needs kids could benefit through one of my stories is extremely gratifying. What caused you to become involved with the special needs community–and have you found your work on the a4cwsn site gratifying as well? A. I love what I do and I hope others do also. I got involved because of my children. #6 is due any day now and my other five are the reason I get up every morning. My eldest is 18 and now has special needs. Benjamin who just turned 6 is also on the spectrum so I will never stop, I will never give up and I will do all I can to help anyone who needs it. 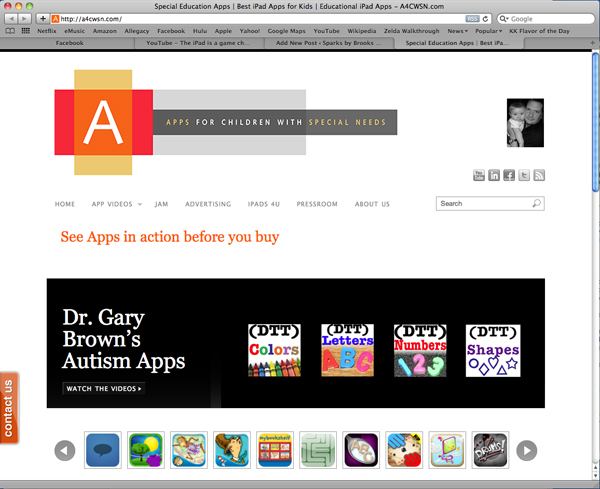 Make sure you both bookmark the Apps for Children with Special Needs site (a4cwsn.com) and Like them on Facebook. I understand Gary is gearing up for another app giveaway extravaganza soon! Thanks to Gary for his thoughtful responses.